Planning for an efficient wine storage facility begins from the wine cellar design process to choosing the right materials and equipment, and constructing the wine cellar. Two important factors that must be considered to ensure efficiency are temperature and humidity. Stable wine storage temperature and humidity levels are crucial to creating the best possible climate conditions for storing and aging wines. Wine cellar refrigeration units California are designed to help achieve and maintain the proper wine storage environment. An efficient wine cellar cooling system will consistently cool and stabilize climate conditions with little intervention and the minimum consumption of electrical power. The optimum wine storage temperature is no more than between 50°F and 55°F, and the ideal humidity range is within 60 to 70 percent. For efficient residential wine cellar cooling and commercial wine cellar cooling Los Angeles, a proper support infrastructure must be in place. A wine storage space must be highly insulated, enclosed with vapor barriers, and equipped with a wine cellar door. A carefully designed and constructed wine room will ensure that the cooling system will function efficiently and effectively over time. 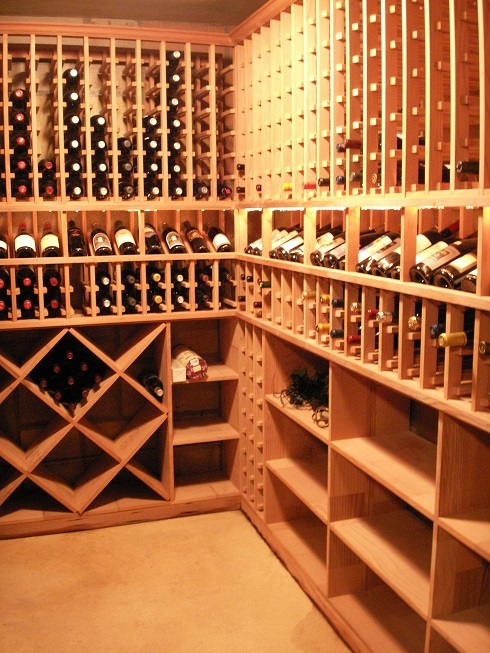 There are a number of wine cellar cooling solutions available on the Los Angeles market today. For affordable and commercial grade quality wine cellar refrigeration units, Wine Guardian Cooling Systems stands out among the rest. They offer residential wine cellar cooling and commercial wine cellar cooling Los Angeles products that will reliably provide exceptional performance in cooling and stabilizing environmental conditions in a wine storage space. Wine Guardian is a world-renowned leader in providing quiet and energy efficient wine cellar refrigeration units for residential and commercial applications. 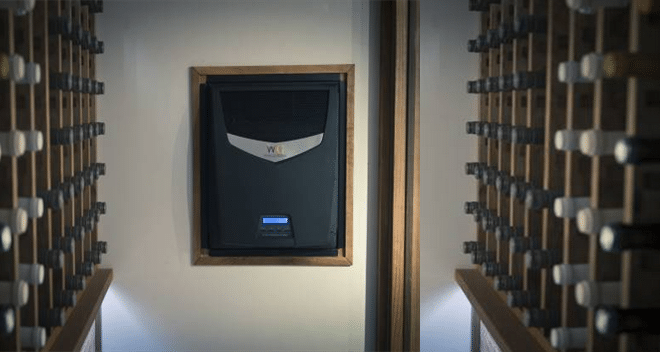 They offer a line of climate control systems for any size of wine storage space, including through the wall refrigeration system, the ducted system, and the ducted split system. Through the wall refrigeration systems are one-piece units that contain the evaporator, the compressor, the condenser, the fans, and control. They are the most affordable, and the easiest to install among the three wine cellar refrigeration units. Since this cooling system is visible inside the wine storage space, it is designed with a sleek appearance. This allows it to complement any wine cellar interior. Through the wall units by Wine Guardian come with a modern look that can match any contemporary wine cellar design. Compared to other through the wall systems, their cooling units are engineered to provide extremely quiet operation. 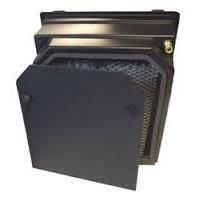 The cooling units are designed with adjustable louvers that allow for efficient air flow. Wine Guardian’s through the wall refrigeration system is ideal for small to mid-sized wine rooms. The unit is available in two capacities: TTW009 (for wine cellars up to 850 cubic feet) and TTW018 (for wine cellars up to 1500 cubic feet). Ducted self-contained wine cellar refrigeration units Los Angeles offer optimum flexibility in design and system location. The cooling unit can be mounted within or outside the wine storage space. This set up allows for maximum storage capacity, and eliminates the presence of mechanical equipment inside the wine cellar. A remote sensor kit is required when mounting the unit in any location outside the wine room. A grille on the interior wall is connected by well-insulated and flexible ductwork to the refrigeration unit, which is located outside the wine room. Ducted self-contained wine cellar cooling systems consist of multiple supply air openings for versatility in installation, and removable panels for ease of access. They provide cooling capacities for both residential and commercial wine cellar cooling. The largest model can reliably cool wine rooms up to 8,500 cubic feet in size. 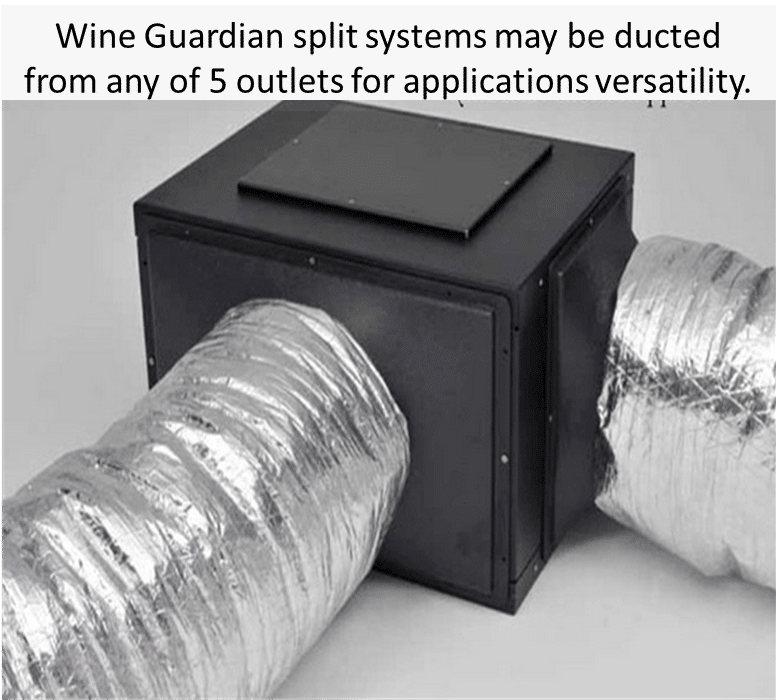 Wine Guardian’s ducted split system provides optimum air circulation for wine cellars of any size or configuration. The cooling unit is best for wine cellars with little to no room to accommodate a climate control system. A split system separates the evaporator unit from the condensing unit, offering multiple installation options, as well as providing efficient and reliable cooling. These refrigeration units are engineered to facilitate effective commercial and residential wine cellar cooling. Wine Guardian ducted split systems are available in four models: SS025 (for areas up to 2,000 cubic feet), SS050 (for areas up to 3,000 cubic feet), SS088 (for areas up to 6,000 cubic feet) and SS200 (for areas up to 8,000 cubic feet). 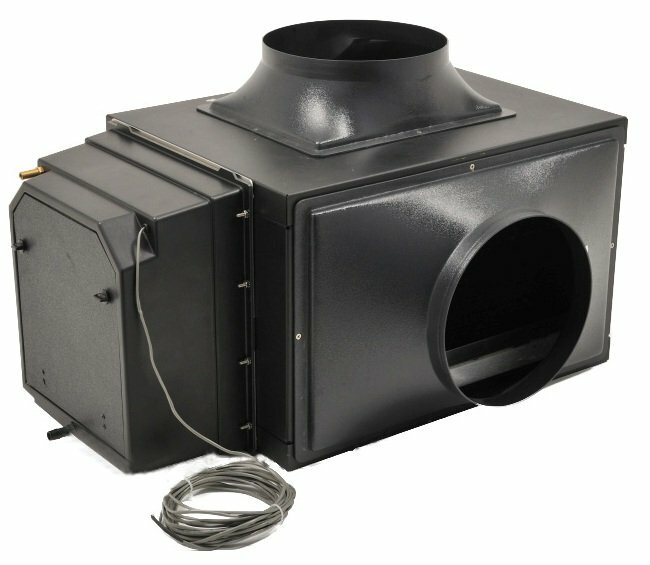 These models come in ¼ ton, ½ ton, 1-ton and 2-ton cooling capacities. 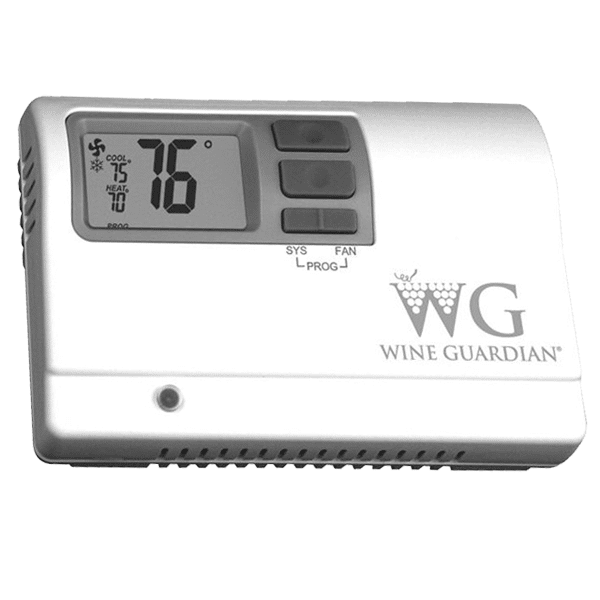 Wine Guardian also offers humidifiers in integrated and freestanding models. Humidifiers are designed to facilitate proper wine aging, by increasing the level of humidity in commercial or residential wine cellars. The integrated unit is only compatible with a Wine Guardian Cooling System, while the freestanding unit can be used with a WG climate control system or any other brand of wine cellar refrigeration units California. Optional WG Remote Monitoring Controls and Sensors are available. Controls and sensors allow for the constant monitoring of wine cellar conditions, to ensure that wine storage temperature and humidity remain at optimal levels. A remote interface controller is designed to control temperature and measure humidity. A remote sensor displays thermostat and humidistat readings, and sends out an alarm signal, should conditions in a wine cellar slip out of range. 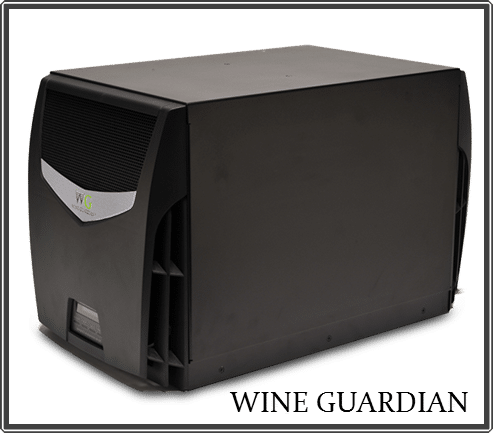 All Wine Guardian Cooling Systems and Humidifiers are designed with an all-aluminum frame, and built with corrosion resistant components for superior durability. Their products undergo extensive testing before leaving the factory, to ensure the reliability of the components and equipment. In addition, WG Cooling Systems are ETL to UL and CSA certified. If you need wine cellar cooling maintenance or installation services, just contact M&M Wine Cellar Cooling Los Angeles at +1 (323) 578-3330. We specialize in the installation of wine cellar refrigeration units Los Angeles, for both residential and commercial locations. M&M Wine Cellar Cooling Los Angeles is a licensed and insured company, with more than 10 years of experience in the wine cellar industry.